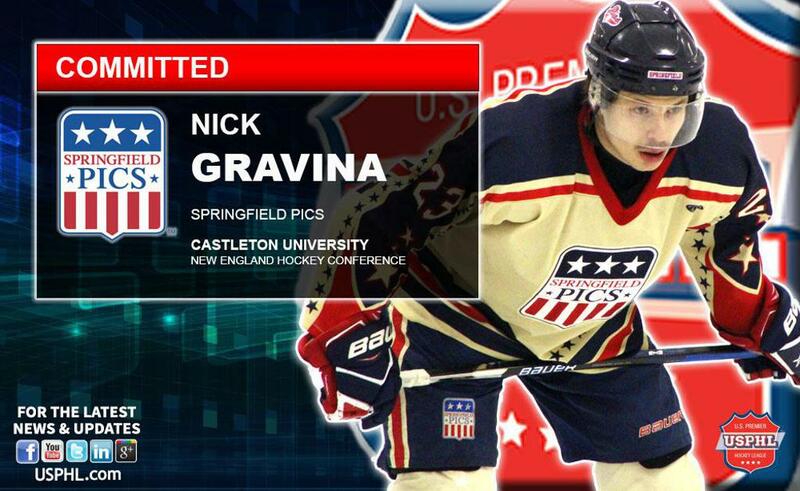 WEST SPRINGFIELD, Massachusetts—The Springfield Pics are proud to announce that forward Nick Gravina has committed to Castleton University for the fall. The hard-nosed forward dressed in 38 regular season games for the Pics in 2016-17, scoring two goals and seven assists for nine points, before adding two goals and an assist for three points in five playoff games as the Pics reached the Premier Division Semifinals. "I'm really excited to join the Castleton University Spartans. I couldn't have done it without the help of all my coaches and teammates throughout my junior career who have always pushed me to succeed,” Gravina said of joining the Spartans roster, adding “Every player dreams of playing NCAA hockey and I have the opportunity to make that a reality." Castleton competes in the New England Hockey Conference, and last season improved significantly, finishing 11-10-6, including a 7-5-4 conference record and an appearance in the NEHC Semifinals, where they fell to eventual national champion Norwich. Chris Wagner wins NHL Bruins 7th Player Award for 2019!